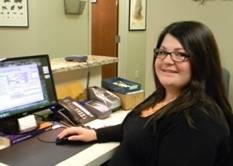 Greeting you at the front desk with a smile, Renee will cheerfully assist you with appointments, paperwork, "checking-in" at the front desk and verifying your insurance coverage. We realize there can be many questions concerning registration, insurance verification, medical history questionnaire and privacy issues. She is very patient and takes whatever time is necessary to assure you have all the answers to your questions regarding coverage, co-pays and deductibles. She is here to help so don't hesitate to ask!